I've had this sketch on my desk since Tuesday with good intentions, but after I went to the Dr. I've been down. I'm up for awhile trying to feel better. I have to give credit where credit is due: this sketch is from Our Creative Corner, but these talented gals have changed their site up a little bit and started out fresh calling themselves OCC Weekly Sketch which will post a new sketch on Thursdays, hop over there and get in on Sketch #1. 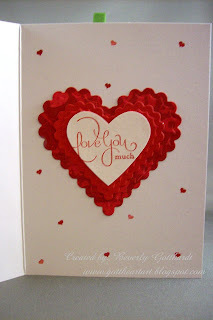 For the ABC Challenge, my new stash are products from Stampin Up and I'm loving them. 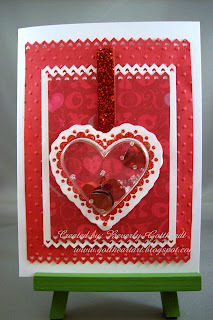 The Pinking Hearts punch, and 2 clear mount stamp sets Well Scripted and Sweetheart. These clear mount stamp sets are wonderful to use and store. Supplies: White Card Blank 4" X 5 1/2" Halcraft, Paper: K&Co. Brenda Walton Sweet Talk Specialty Paper Pad, Stamps: Stampin Up-Well Scripted, Sweetheart, Rubber Stamp Tapestry-tiny heart, Ink: Stampin Up-Riding Hood Red, Tsukineko-Glue Pad, PK Glitz Twilight China Red embossing glitter, Stampin Up punches-Full Heart, Pinking Hearts, Cuttlebug embossing folder-Swiss Dots, Spellbinders Nestabilities-Classic Scallop Heart, glass beads, heart confetti, glitter velvet ribbon-Hobby Lobby, glue dots. Fab card, wish we had those shaker boxes over here! Beautiful work. Thanks for joining the ABC challenge this week. Great card, Beverly - very luxurious. Love the inside too. What a beauty, Beverly! Love the bright, bright red and the shaker is frosting on the cake - just so cute. So happy to see you joining in the fun at the Creative Card Crew!